Déjà vu? How history repeats itself. I can still quite clearly remember my history lessons in school (that’s probably because it wasn’t that long ago) where we studied The Great Depression in the U.S and its effects on the rest of the world. I even remember a cartoon representation in a textbook showing a German man using money to make himself a fire because it was completely worthless to him. Being a history student at heart (perhaps even more so than I am a journalism student) I know we often see history as being about ‘them’, and never us. We see it as the study of the people of the past, their suffering, their wars, their actions- and not often do we think about our suffering, our wars, our actions. I was doing my daily news check up on the net the other day and came across an article about… wait for it… impending doom! (If you’re a regular reader of my blog posts you would have by now discovered my love for melodramatics). How this will affect our rate of growth of exports is quite obvious- The rate of growth of imports into wealthy nations is expected to drop sharply, leading to a cut in the rate of growth of exports by developing countries (ie. us). 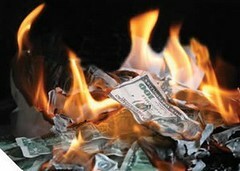 What are the implications of this financial mumbo jumbo? Who will suffer? Certainly not Eskom’s directors (I’m still reeling from the shock of their bonuses). The working class, your average Joe, his wife and his three kids. Those are the people who will have to deal with inflated food costs and with the Credit Act (despite its perhaps honourable intentions) making it increasingly difficult for people to get home loans, Joe’s also gotta worry about putting a roof over their heads. Here’s what happened in my brain when I was reading the article: I imagined us burning our paper money to make fires, then I thought about the Zimbabwean dollar which could already be used for this purpose, then I thought about cheese (I was hungry), realised that the price of dairy products have sky rocketed, and then I remembered the bread cost saga and a whole chain of neurons (or whatever they are) went firing off in my brain! Is it just déjà vu or have we seen this all before? In a different era, under different circumstances, in a history textbook I used in school?? 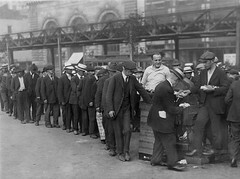 Ok, so maybe we’re not facing an economic recession comparable to that of The Great Depression, but what is repeated is that it’s the same class of individuals who will bear the brunt of it. Economic inequalities have haunted our past and still are a reality today. But what do we do? How do we protect Joe and his family? Not an easily answered question. I’m siding with the director of the International Labour Organisation (ILO) who says that what we need is to “find a better balance between the democratic voice of society, the productive dynamic of the market and the regulatory function of the state”. Whatever that means. So it’s confirmed then, history does indeed repeat itself. You would assume that the logical conclusion is to learn from our fellow homo sapiens mistakes. HA! If only we were logical. 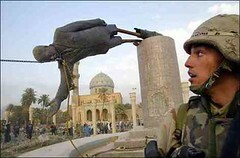 This week was the 5 year anniversary of the day the late Saddam Hussein’s statue was toppled by U.S forces in Baghdad. An event which will feature in the history books my children will one day study from. 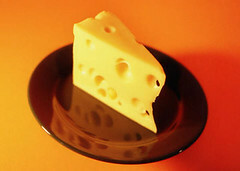 And maybe they (if they get their mothers brain) will consider the same things I am: about the past, about our actions and about cheese (sorry, I’m still hungry).